Its Autumn school holidays here at the moment, and I've taken this last week off work to spend some time with the kiddos. Today's was actually my Son's birthday, he wanted to play golf, so the four of us headed out and played nine holes. He loved having a swing with the golf club (as did I), but I think he enjoyed getting a chance to drive the golf cart most of all. We went out to Teppanyaki Japanese for dinner, which is always entertaining for the kids. Earlier this week we visited Questacon, which is the National Science and Technology Centre that is a hands on science based museum for the kids. My two loved it and I could see their inquiring minds thinking and exploring ideas. However it shocked me just how many children , and I'm not talking little kids, I'm talking 10-13 year olds, couldn't be bothered reading the explanations or listening to the staff about how and why things worked the way they did. Instead they would run up to an exhibit and grab whatever it was before some else could and then shake it, or bang it or spin it to see what is did and the would run off. I can't imagine that they learnt anything! Anyway, enough about my life, lets look at my nails instead. It had been ages since I'd used some of my metallic Hit the bottle stamping polishes, so I pulled out three complementary colours and noticed that they looked fabulous next to a new Bow polish I had. 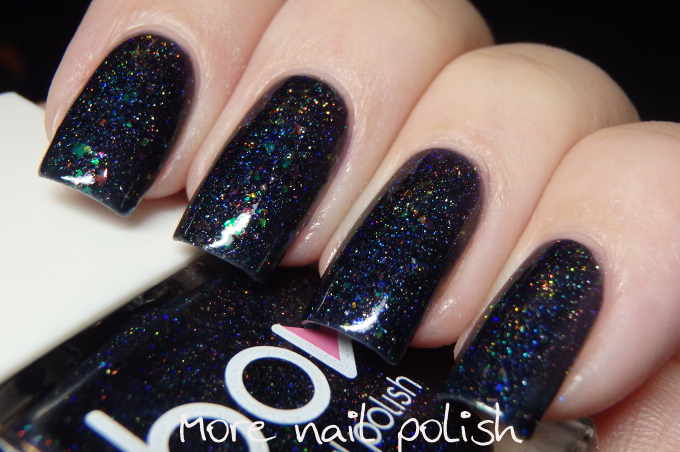 The Bow polish is called Dark Days and it's a black jelly polish with multicoloured flakes in it as well as scattered holo shards. 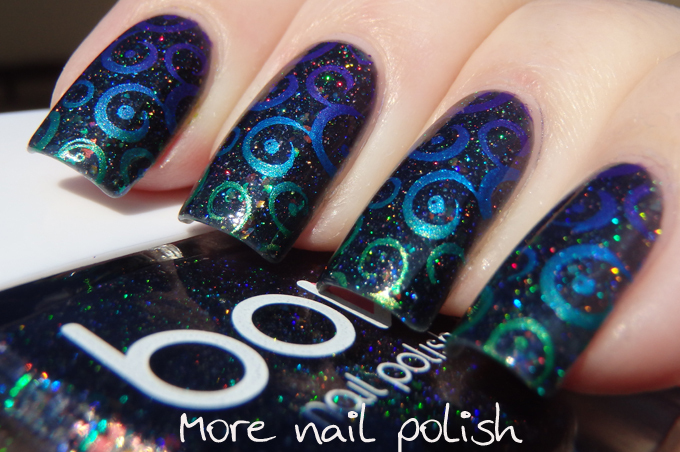 Here is the finished mani using PUEEN46 plate and purple, blue and green stamping polishes from Hit the Bottle. 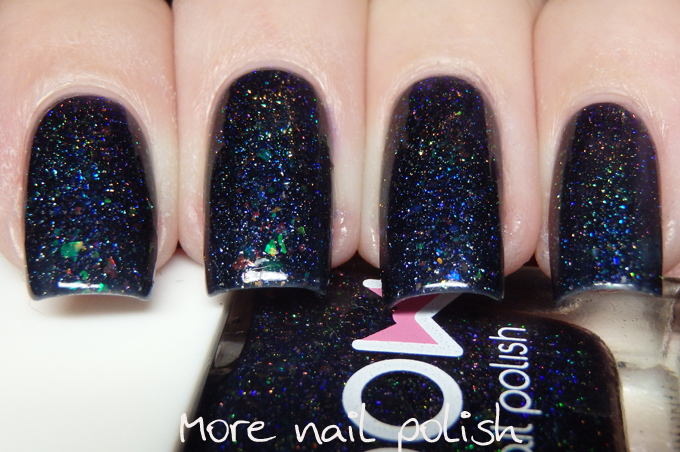 I remembered to snap some swatch photos of Dark Days on it's own before I stamped over it. 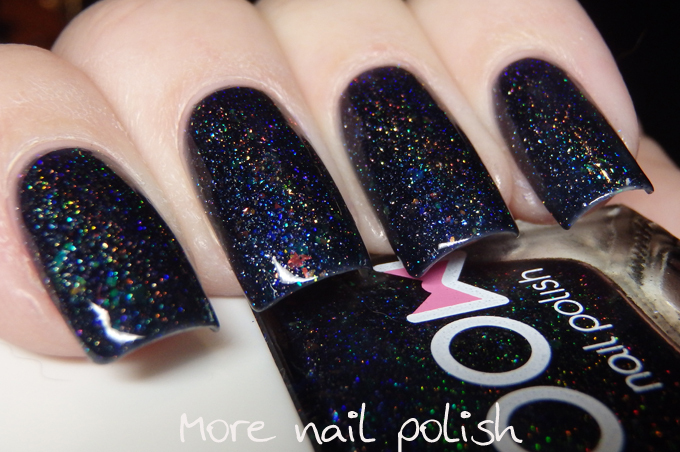 The formula was great and it was opaque at two coats, although I did three thin coats to get more depth to the multicoloured flakies. 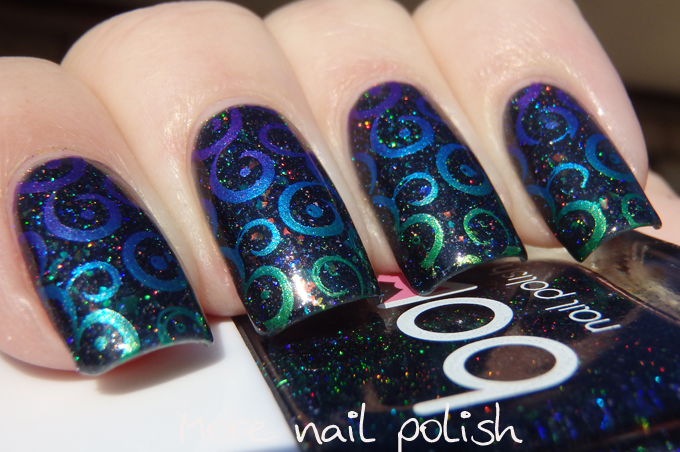 The tricolour stamping looks AMAZING!